Ride 500 kilometers in 8 days. Give your legs the greatest gift this holiday by riding 500 kilometers with Rapha and Strava. Once again, Rapha and Strava are challenging riders around the world to clock 500 kilometers between Christmas Eve and New Year’s Eve. However, Rapha is not only interested in how fast you go or how far you can push yourself. They also want to see interesting stories, creative ways of documenting each ride, and conscious displays of style on your journey. Share evidence of your endeavors via Facebook, Twitter, Instagram, Youtube, blog and the postal service using the hashtag #festive500. The rider who sends Rapha the most creative record of their ride will win a place on a Rapha Cent Cols Challenge in 2014. Learn more by visiting the the Rapha Festive 500 webpage. Cutoff date to submit evidence and/or claim the finishers roundel from Rapha is January 17th, 2014. 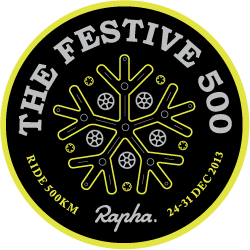 Riders that complete the Challenge will receive a Rapha Festive 500 woven badge to commemorate their achievement. UPDATE: Finishers must submit their mailing info to Rapha by January 17th, 2014 to receive their roundel. Visit the Rapha Festive 500 webpage on Rapha's site to enter your info. 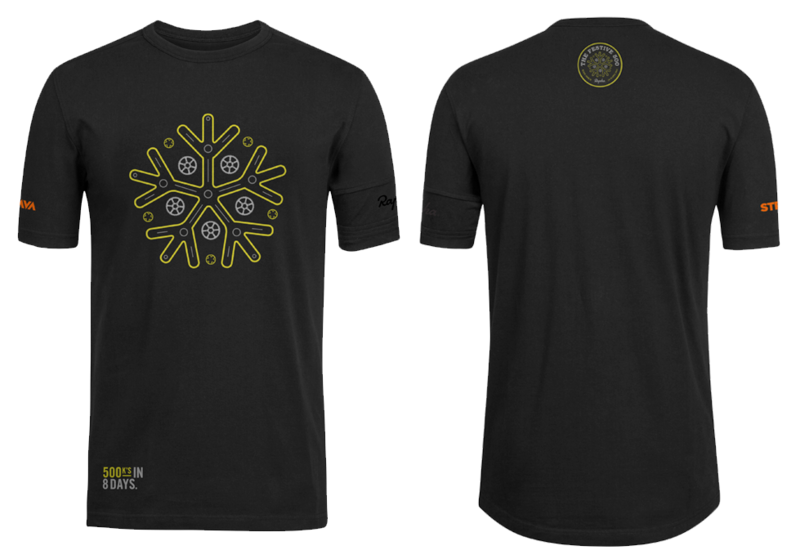 Riders that complete the Challenge will have the ability to purchase a limited edition Rapha Festive 500 Tee made by Rapha for $40. A link to purchase will be emailed to all finishers on January 6th at 10:00am PT. There will be limited quantities available, so plan to purchase soon after the email arrives in your inbox. The Tee will be available to purchase until 11:59pm PT on January 15th. Orders will ship 2-3 weeks after this purchase window closes. Please Note: If you are interested in receiving information on how to purchase the Rapha tee or submit your address for the woven badge, you must be opted-in to Strava's email newsletter (called 'Updates and Tips' in the notifications settings on the mobile app). All activities logged during the Challenge period must be uploaded to Strava no later than 1/3/2014. 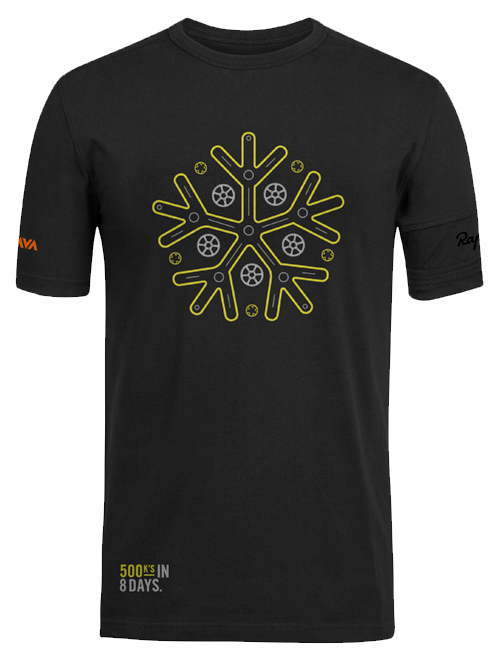 Strava (“Sponsor”) is pleased to introduce the Rapha Festive 500 (the “Skill Challenge”) made available at www.strava.com (the “Site”). As a condition of participating in the Skill Challenge, entrant (“You” or “Your”) agrees to be fully and unconditionally bound by these Official Rules and the decisions of Strava, whose decisions shall be final and binding in all respects, and to waive any right to claim ambiguity in the Skill Challenge or these Official Rules. You may enter the Skill Challenge by going to the Site before 12/31/2013, clicking on the corresponding Skill Challenge URL that will direct You to the Skill Challenge landing page, where You will be entered into the Skill Challenge by clicking on the Join button. Starting from the day the Skill Challenge begins on 12/24/2013, you have until 12/31/2013 (8 days) to ride 500 kilometers. Each activity (Ride) must be logged on the Site and cannot be inputted manually. In addition, indoor rides done on the trainer will not be counted towards the Challenge. For more information regarding how to log activities on the Site, please see Strava’s How It Works page (http://www.strava.com/how-it-works). If You successfully log 500 kilometers of riding, You will be a prize winner, subject to Sponsor’s verification. Any form of entry and participation in the Skill Challenge other than that described herein is void. To earn credit for activities logged within the start and end dates of the Challenge, All activities must be uploaded to Strava no later than 1/3/2013. Each prize winner will win a commemorative woven badge (Approximate Retail Value ("ARV"): $0). Total ARV of all prizes: $0. Sponsor will announce the potential winners of the Skill Challenge within one (1) week after the conclusion of the Skill Challenge on 12/31/2013. All potential winners who have opted in to receive email notifications from Strava will be notified via the email address associated with the potential winner’s account. Prizes will be deemed to have been won when all conditions in these Official Rules and accompanying Terms (http://app.strava.com/terms) are met. You have not yet won a prize. The actual odds of winning any prize will depend upon an entrant’s ability to complete the Skill Challenge. Skill Challenge ends on 12/31/2013. See Official Rules above for entry requirements and complete prize restrictions. Sponsored by Strava, 500 3rd Street, Suite #110, San Francisco, CA 94107.